My last Dooce guest post is up, and I’m talking about Twitter. I am embarrassed to admit that a quick search reveals that I talk about Twitter a lot, although usually on my Tumblr, Damn, Gina, which I update at least once a day, whereas I let my blog sit dormant for days and even weeks at times. Why is this? Tumblr feels more intimate and friendly, the things I liked about blogging back in 2002. Also Tumblr is easier, cheaper, less formal, more fun, and that’s just the kind of girl I am, so that shouldn’t be much of a surprise. One thing: Tumblr makes more sense if you start one one yourself. Even if you don’t post, that way you can read everyone you follow in your dashboard, all at once, and give feedback and reply and reblog and what have you there. On Monday I’ll post a list of my favorite Tumblrs for you to follow, if you’re interested in funny people and good writers and pictures of Skeksis. Basically all the good things in life. I put on my bad idea jeans the other day and wrote a Dooce guest post outlining the most exciting fights my mother and I have had throughout my life. You can read it here. NOBODY expects the Spanish Inquisition!, originally uploaded by Sarah Brown. I spent last week in Seville, with not a single Janice in sight. It was very hot and very relaxing. Our days were punctuated by gin & tonics and jamón and ice cream, and then it just all started all over again after a nap and a shower. Spain, we speak the same language (except actually we don’t). I used to know how to speak Spanish fairly well, years ago. When I was in college, I took enough Spanish in one year to fulfill my language requirement that every so often I’d catch myself thinking in Spanish. But after my classes ended, that skill quickly atrophied. A few years ago while visiting Paris, whenever anyone asked me anything in French, I would answer, “Sí,” before I could stop myself. It was like the language center in my brain recognized Other and just spat out the first thing it could find that wasn’t English. Before we left for Seville, Nick said, “Okay, you’re going to do the talking,” and I said, “Unless anyone asks me a very slow question about the train station or ice cream parlor, that’s not going to work.” From the minute we landed, whenever anyone said anything, the only thing that was on the tip of my tongue to reply was, “Las cucarachas entran, pero no pueden salir,” from the Ren & Stimpy International Log commercial. Thankfully we were with our very fluent friends Dan and Mishka most of the time, so I didn’t get the chance to tell anyone this bit of wisdom. For as long as I can remember, the only specification I’ve had about my wedding ring is that I want “Nobody expects the Spanish Inquisition” engraved on the inside of it. Nick is the only man I’ve ever dated who not only got this, but also thought it was a great idea, which was one of the earliest points he got in my book. 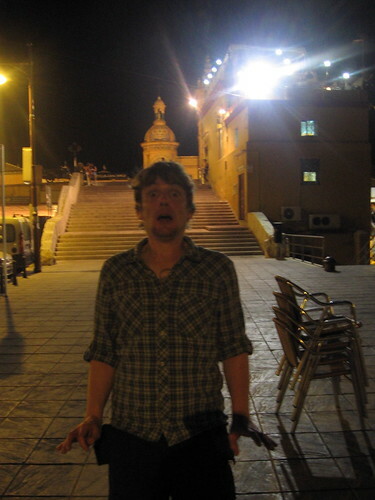 And here we were in Spain, taking a picture of it without realizing what it was! All of my nerd planets aligned! We left Spain with a suitcase full of cava, a flamenco dress for Esme, and a dry-cured pig’s leg in Nick’s backpack, the hoof peeking out the top. We came home to the news that the first part of our visa application had been approved. I’m trying to think of a cute or funny way to end this but I can’t really think of anything better than that. I have another guest post up at Dooce, this time about how I’m not planning a wedding. Not for lack of trying: when I visited in January, I told my mother I wanted to recreate the Wendy’s Super Bar at our wedding reception, all pasta salad and chocolate pudding and croutons, maybe even buy an actual dismantled Super Bar off the internet, and my mother said, “No.” And then I brought out the big guns, the only wedding dream I’ve ever had, which is the Potato Buffet. Mashed potatoes, baked potatoes, french fries, tater tots, potatoes au gratin, pierogis, hash browns, whatever, and then just a bar of condiments and fixins. God do I love a fixin. My mother said, “Are you being serious? Absolutely not, no, that’s a horrible idea,” but my father smiled, so I think I still have a wedge there, no pun intended.